The impact of this narrative is a disorienting mix of faith and reason, the extraordinary and the familiar. Toward the end of the story, Olokun is given the ability to fly, takes off into space and “…swims oceans throughout the galaxy…” Here the author inserts a radioactive dagger from Fukushima and Hopi prophecies into the mix. 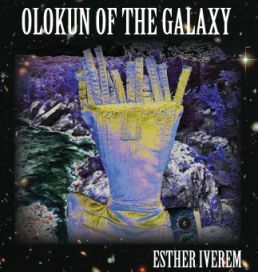 The author includes a four page Epilogue of various facts of selected planets, moons, and stars which are identified as favorite places for Olokun to swim and relax. “Olokun is truly of the Milky Way Galaxy! Olokun says Black Lives Matter! Water is Life! Mni Wiconi!” (Native American Lakota for Water is Life). This book serves, first and foremost, as a marketing device to accompany the author’s Galaxy brand ‘pants dolls’ created in 2012 from recycled denim pants. As ‘contemporary African spirit figures’, Iversen calls the doll Olokun, the name having its roots in Yoruba religious beliefs in southwest Nigeria and across numerous African Atlantic communities as the deity (orisha) of the sea and wealth. Olokun serves as the author’s narrator, however, the plot is not situated in southwest Nigeria and it is discouraging to see another failure to promote cultural or temporal specificity, perpetuating misconceptions of the African continent comprised of fifty-five countries. Further into the story, the Kiswahili word for disaster (Maafa) is used to reference the catastrophic trauma and suffering of the Middle Passage. Kiswahili is a language spoken in eastern and southeastern Africa, adding to the confusion. A second Yoruba deity Oya is introduced for one short line and the two god-superheroes with ‘capes blowing’ – send hurricanes to the Land of Maafa. We never hear from Oya again. The combination of scientific fact with a confusing mixture of mythologies and words from varied countries and cultures might appeal to readers of dystopian science fiction or to the people who have purchased the author’s Olokun dolls. Other readers will be disappointed with this uneven effort. Production of the book: Pictures of the author’s Olokun doll are digitally inserted into twelve NASA-produced landscapes that provide the backdrops for the ‘water places in the Universe for Olokun’. The font is Comic Sans MS and is easy to read against a textured light gray ‘starry’ background. Overall Production/printing values are not of high quality.